Mimi is great fun, she's always up for a good laugh and she always thinks what you think. I always do what she tells me because she is so kind. I love her and she's my old nursery teacher. And that's what I think!!! I've used Mimi's Minis several times for my active 20 month old son, he always has a wonderful time! Really useful to have ad hoc care offered as I work freelance. I've always found the service offered to be of exceptional quality. 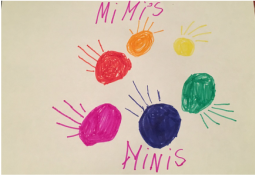 I recommend Mimi's Minis to any busy parent who needs an expert helping hand. Mimi is fantastic. The children adore her and miss her hugely. She was totally unfazed by anything, always full of fun ideas and was a joy to have around. We met Mimi at nursery school. She was very welcoming and loving towards our 4 year old son who had just been told he was not a good fit for his Kindergarten so had to be moved after only 6 weeks in Kindergarten. Mimi’s positivity and encouragement made an immediate positive impact on our son who suddenly couldn’t wait to get to school every morning. No matter what challenges we had with our son Mimi made a point to get to know him well and came up with creative solutions. Our son truly loves her and looks forward to spending time with her. I would highly recommend Mimi for anything from child care to tutoring as I saw first-hand what huge strides our son made under her guidance. Mimi is reliable and very responsible. She truly enjoys being with children and always seems to get the best out of them. She is always smiling and has a positive demeanour at all times. She is understanding and flexible when we have had problems arise. She has always had our child’s best interests at heart. Mimi is BRILLIANT! My children adore her, she is warm, caring, reliable, organised and most importantly fun. Totally trustworthy and always the first person I turn to look after my kids. Mimi has been a great help. We took the big step of trying a brand new babysitter after using the same person for a long time, and Mimi made sure we were in the capable hands of Marion who arrived, put us all at ease, had the kids chatting away and then settled in bed before they even noticed that we had headed out for the evening. Thank you!!! Mimi has a great rapport with children of all ages and understands their differing needs. Her own experiences teaching and nannying means she takes a great deal of care over who she puts on her books and she has very high standards when it comes to childcare, experience and personability. She always makes sure she finds the absolute right carer for your child. Mimi's Minis is a godsend!